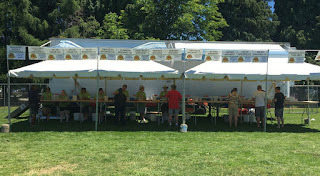 The first time I attended the Oregon Brewers Festival in 1991, it was a revelation. Drinking good beer while mingling with folks in a great outdoor setting was an unknown experience in those days. It felt rather odd and at the same time pretty cool. For years and years, the OBF was the only significant show in town. If you missed the festival experience for whatever reason, as I did when I was out of town in 1992, you were stuck waiting until the following year. Not much happening in-between. Fast forward to modern times and things have changed dramatically. There are now numerous festivals crammed into the calendar. If you can't or don't want to be a rock star brewer, the next best option is apparently to have your own beer festival. I blame Art Larrance and the Oregon Brewers Festival. Because if the OBF hadn't set the stage, then created and refined the template for what a beer festival should be, we probably wouldn't have all of these events popping up, competing against one another. But never mind. The proliferation of festivals, a fact of life, has now reached the point where they threaten one another's well-being. There simply isn't enough room on the calendar to accommodate everyone, particularly during the peak summer season. As a result, events are piling on top of one another, inhabiting the same dates. This weekend is a perfect example. We've got multiple events vying for the time, attention and dollars of beer fans. 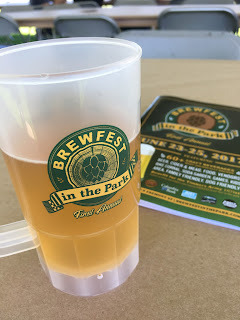 I attended Brewfest in the Park. It wasn't necessarily an easy decision. Competing events include the Portland International Beer Festival, Kriekfest out at Solera in Parkdale, and a host of worthy smaller events. How Brewfest in the Park (formerly the Organic Beer Festival) and PIB wound up on the same weekend is sordid story. A couple of years ago, PIB unilaterally took the Organic Fest's June dates. The Organic folks caved and moved their event to August, a change that didn't work out for them. This year, Brewfest organizers decided to reclaim their original dates, putting them up against PIB. The PIB folks aren't happy. But who started this? Ezra has some answers here. Bigly! It was evident during my Friday afternoon stay at Brewfest that having multiple events in the same calendar space is having an impact. There was never much of a crowd and it was never remotely busy. You might attribute some of that to changing dates. Fine. But I've never seen so few people at any large Portland festival, at least not in recent times. Nope. It occurred to me that poorly attended fests are the coming reality unless there's more collaboration and cooperation among the festivals...a laughable notion. There's money to be made and everyone thinks their festival can win the war for patrons. So they'll carry on. I doubt we'll see any significant cooperation until attendance at individual fests bottoms out. With respect to Brewfest, the updated layout of trailers and shade tents seemed pretty decent. I had as many mediocre beers as I had good ones, but I'm a snob and I didn't taste everything on the menu. I didn't miss the lack of live music. But I did miss being able to easily find drinkable water between beers, which should never be an issue. No excuse, folks. What's the future of Brewfest? Even if this winds up being a lousy attendance year, which seems likely, the event will carry on. Switching dates is always a concern, even if competition isn't. These folks are connected to the OBF and know how to run festivals. They will be back, I'm sure. I'm less sure how competing events are going to share space on the short summer calendar. So crowded. Maybe event organizers will eventually be forced to consider dates on the fringes of summer. I have no sense at all of how or if this is going to be resolved. at a beer snob I can tell you the Portland International Beer Festival selection was so much better than Brewfest in the Park. So PIB won the competition for fans. Terrific. What do you suppose Brewfest would have looked like if there had been no competition? That's the issue.